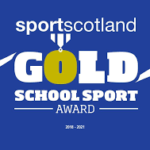 What a busy term we have in store for Primary 5! We have had a ‘Bairns in the Kitchen’ experience on Week 1. 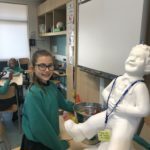 Primary 5 have been honing their skills in the kitchen and learning about healthy life choices. P5A (Group 1) were making a vegetable curry and were preparing and mixing all of the ingredients by following instructions on the recipe. Your child will get the session every second week and we hope they develop some confidence and skills in the kitchen that will prepare them for life. Primary 5 have also been reconnecting with their pen-friends in Kenya. We are twinned with Karina Primary School and the link came about through Myles Edwards and his Gathimba Edwards charity. The children were excited to get replies form Kenya and are looking forward to updating them with news from our school this term and sending our second batch of letters shortly. 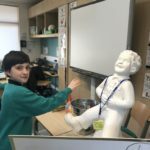 Oor Willie visited today to encourage us to display the school values – we filled his bucket with courage, opportunities, responsibilities, respect and fairness. Primary 5 have had a really busy term and have been thoroughly engaged in our learning contexts. Firstly, Primary 5 were studying the Jacobites and were immersed in several meaningful activities. The children were fascinated with this period of Scottish history and made connections between historical events and the way our country operates n the present day. Primary 5 looked at ‘Kaspar;Prince of Cats’ by Michael Morpurgo as a literacy focus and thoroughly enjoyed the novel. The book was based on fictional characters in 1912 who made the maiden voyage of the Titanic. This led to some wonderful creative writing and Art and Design experiences that everyone thoroughly enjoyed and benefited from. We look forward to an exciting and busy term 4.